Chinese actress, Kitty Zhang (张雨绮) walked the red carpet of the 2013 Cosmo Beauty Awards held in Shanghai, China on November 7, 2013. 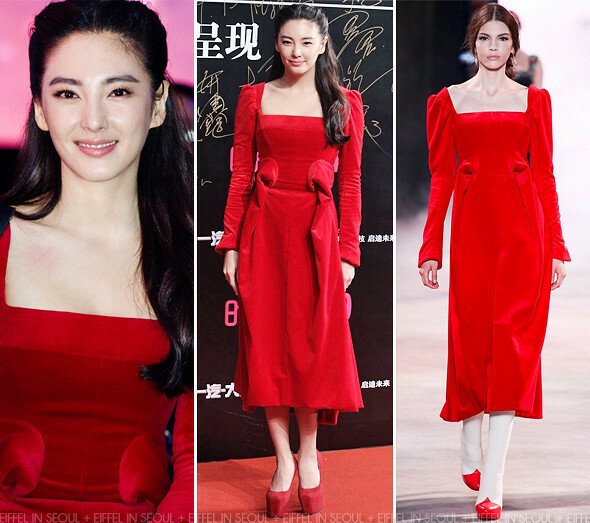 The Chinese actress opted for a red dress from Ulyana Sergeenko Fall 2013 Haute Couture collection. A pair of red stacked pumps from Giuseppe Zanotti to complete her look. I didn't like this look as much as her past few outfits on the red carpet. It lacked a little sparkle and it was too matchy-matchy with the red pumps.